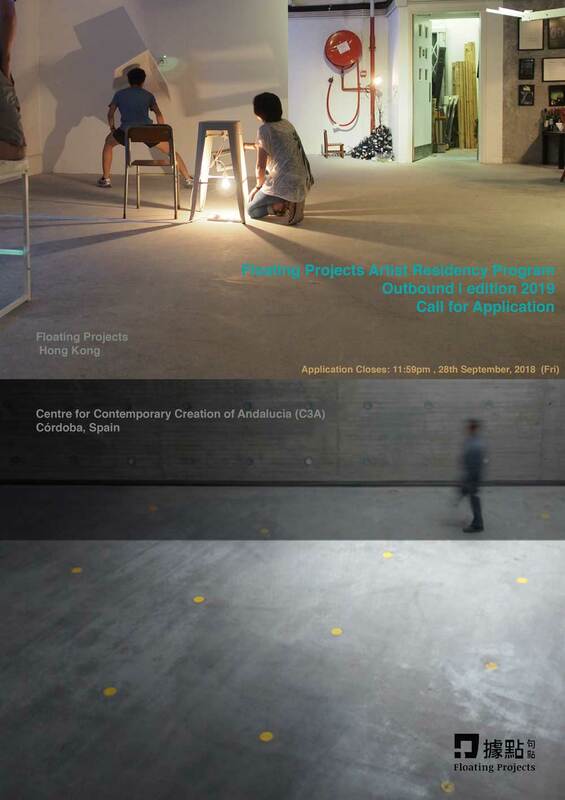 *Floating Projects is collaborating with the Centre for Contemporary Creation of Andalucia (C3A / Centro de Creación Contemporánea de Andalucía) in Córdoba, Spain, to send TWO artists from Hong Kong to take a month-long residency at C3A. *The first edition of Artist-in-Residence program will start in Mid Jan 2019. *TWO Hong Kong based Artists will be selected by Floating Projects. Selection will be based on maturity and relevance of proposed art project which the applicant will materialize at C3A through research and experiments. *The two artists will participate in talks and presentation to introduce their work and to exhibit them to the local public in Cordoba as well as Hong Kong. 2.1 Anyone who is a permanent resident of Hong Kong. 2.3 Preferences are given to artists who have not had a residency in the past 18 months. 3.1 Artists are expected to engage in C3A activities such as Open Studios, outreach and education, artist talks, etc. These activities aim to provide visibility to the artists in residence. 3.3 Submit a short writing to Floating Projects as a written review of your experience of the residency program. The writing will be posted on Floating Project’s web blog. What Floating Projects will support? **First HK$ 2000 will be issued before the residency, and the final HK$ 1000 upon completion of the back-home presentation. 4.3 Venue support on public presentation upon completion of the overseas residency. **Selected artists are free to explore any other funds available to them. Álvaro Rodríguez Fominaya, is artistic director of C3A Centro de Creación Contemporánea de Andalucía (Córdoba, Spain) and faculty at large MA Curatorial Practice SVA School of Visual Arts (New York, USA). He served from 2011–15 as the curator in charge of collections and exhibitions at the Guggenheim Museum Bilbao, where he also founded the film and video gallery, organizing exhibitions by Christian Marclay, Ragnar Kjartansson, Rineke Dijkstra, Kimsooja, and Shahzia Sikander. From 2008 to 2011, he served as executive director/Curator of Para/Site Art Space, Hong Kong; and between 2002 to 2008, he served in successive positions at Centro Atlántico de Arte Moderno (CAAM), Spain, as curator, chief curator, and acting director, where he organized monographic exhibitions by Paul Klee, Jean Tinguely, Niki de Saint Phalle, and Joseph Kosuth, as well as group shows such as Weather Report. Climate Change and Visual Arts; Scrabble: Video, Language and Abstraction; and ¡Viva La Muerte! Art and Death In Latin America. In addition to his curatorial work, Fominaya has been a consultant lecturer at Sotheby’s Institute of Art, Singapore, part-time lecturer at City University of Hong Kong’s School of Creative Media, and program leader of the Para/Site Art Space-Hong Kong Jockey Club Curatorial Training Program, and has contributed to multiple international art publications. He completed the Postgraduate Program in Curatorial Studies at Fundación “la Caixa” in Barcelona. Linda Chiu-han LAI, Associate Professor in Intermedia Arts at the City University of Hong Kong’s School of Creative Media (SCM), is a research-based interdisciplinary artist. After completing her Ph.D. in Cinema Studies at New York University, she has sought meaningful connective extension to other relevant artistic and theoretical endeavors. She persists in artistic creation as the practice of theory. A critical researcher on the History of Everyday Life, her works focus on historiography, visual and auto-ethnography, urbanity and popular culture. Her teaching revolves around the criticality of micro/meta narrativity. She has also designed, at SCM, Hong Kong’s first courses in generative art & literature at the university level. She founded HK-based new media art group the Writing Machine Collective (2004) and has completed 5 major group exhibitions on questions of computational thinking and contemporary art. Though broadly known for her videography in the international art venues, she creates in different artistic mediums to turn art-making into criticism, history-writing, gaming and voyages of discovery. Her digital and non-digital works have been shown in key venues in many cities in Europe, Asia and the US, including the International Short Film Festival Oberhausen, the Open City London Documentary Festival, LOOP Barcelona, Rencontres Internationales Paris/Berlin, the Jihlava International Documentary Film Festival in the Czech Republic, the Fourth State of Water (CoCA, Torun, Poland), Women Make Waves Film Festival (Taipei), International Centre (New Delhi), and the various Experimental Film/Video Festivals in Seoul (EXiS), Taipei (EXiT), Macao (EXiM), Kuala Lumpur (KLEX) and Hong Kong (HKEX). Lai considers herself a montage artist: to her, images are intensely rich perceptual surfaces that defy the binary division of representation and abstraction. Many of her works also deploy the notion of an archive and self-archiving, including her recent work “1906-1989-2012: Guangzhou-Hongkong-Shanghai-Anji,” commissioned for the 9th Shanghai Biennale 2012 at the Power Station of Contemporary Art, which is also a piece of experimental history playing with childhood memory, the use of everyday objects and folk material, the postal history of Hong Kong and family stories. Lai seeks for intermedia moments and modes of connectivity, be it conjugation, modulation, combinatorial logic, or permutation… Floating Projects is her recent experiment on modes of sustainability in art-making and artists’ associations.